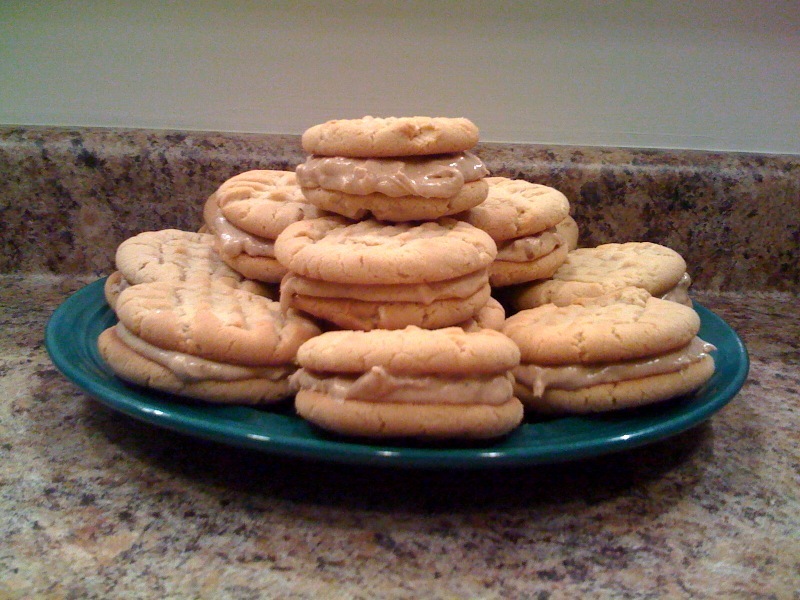 the peanut butter cookie recipe is a classic from the better homes and gardens cookbook. i have a reprinted 1953 edition and LOVE it. the filling comes from a november 2008 better homes and gardens magazine. thoroughly cream shortening, sugars and vanilla. add eggs; beat thoroughly. stir into peanut butter. sift dry ingredients, stir into creamed mixture. form into ping pong sized balls, place on ungreased cookie sheet. press with back of fork to make crisscross. bake in moderate oven (375°) 10 minutes. in a medium bowl, whisk together peanut butter, marshmallow creme, milk, cinnamon and cumin. gradually whisk in powdered sugar. spread 1 tbsp (or so) on bottom of one cookie, and make a sandwich.